Need a locksmith? Chances are, you most certainly will at several points in your life. Thankfully, your local Cardiff locksmith is there for every eventuality. Locksmiths Cardiff cover a range of essential and emergency services, many of which can save the day in some difficult situations, and are more often than not the last thing you think you need – until they happen. They range from every day to the downright unpleasant, but the trusty locksmith is ready and waiting to help in every case. Here are just some of the roles fulfilled by the locksmith. If the security of your home is compromised – for whatever reason – then one of the first things you will want to do is change the locks. Lock changes are one of the key offerings from locksmiths and will ensure that you get a fresh start, and a fresh set of keys, for your home or business premises. A crucial point to remember is that not only the front door is a gateway to your home. All the doors and windows are access points that need securing, and locksmiths are adept at fitting industry-standard, safe locking devices to all of these. If the situation is urgent, then there will be a range of emergency locksmith services for you too. Often, these can provide nick-of-time relief for customers in very difficult and stressful circumstances. There is little worse for the homeowner than arriving to find locks smashed, and the premises broken into. One of the very first priorities is to re-secure the building, and emergency locksmiths are on hand to provide that assistance at the most unsociable hours. The best locksmith Cardiff can offer is one that is available exactly when your needs are greatest. More often than not, if theft or crime are not involved, a door or window lock may not be a total write-off. In cases like these, your local locksmiths may be able to provide a lock repair service, rather than a full lock replacement. This is particularly appropriate in cases where, for example, a key has been broken off and is stuck inside a lock. Many of us have been there, and it is such a helpless feeling. Fortunately, it is usually possible for a skilled locksmith to retrieve the key stub, and – if it is the only copy – to re-cut the key as appropriate so the lock may be used again. Locks are generally built to last, but, like all things, also need some care and attention to remain in good, working condition. Your lock mechanism may have loosened, for example, requiring a good amount of jiggling about with the key before it works. On the other hand, it might have started to seize up, making it increasingly difficult to turn the key inside it. In both cases, it may only be a simple case of fine-tuning the mechanism, rather than throwing out the whole unit. A full replacement of a lock unit could also be an unnecessary cost if the lock is not irreparably damaged, and security has not been compromised. Local locksmiths are able to advise whether full replacement is necessary, or just a simple repair will suffice. For burglary information, visit South Wales Police. Possibly the first experience many people have with a locksmith is key cutting. 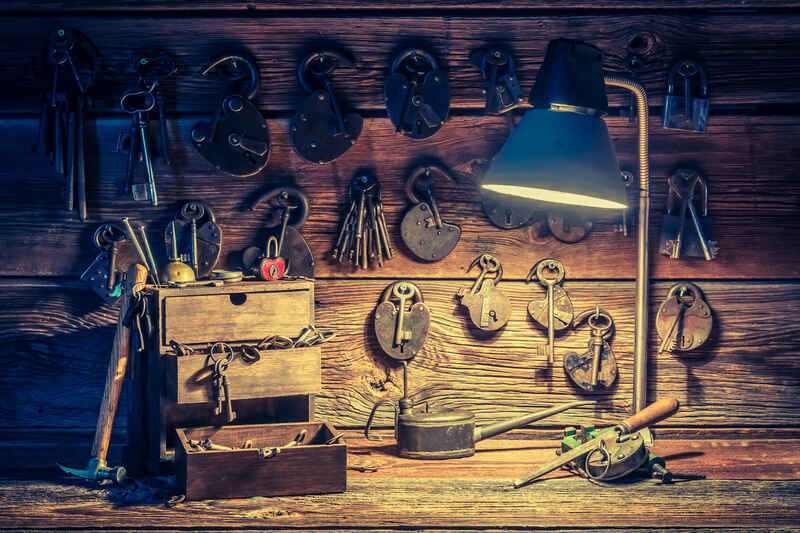 Key copy services are one of the staples of locksmiths in Cardiff, and this is reflected in the typical sight of rows and rows of keys hanging neatly in racks on the walls of your local locksmith. The huge number of blank key options are largely due to the very large variety of types of locks and keys. However, there are lots of other options too, and many of them more fun than serving a certain practical use. For example, locksmiths will often stock a range of themed or novelty keys, including keys in different colours, or blanks featuring the colours or insignia of your favourite football team. Whatever the passion, there’s probably a blank for it. There are myriad reasons to need extra keys cut from your master set. You might simply want a spare pair in case of loss. On the other hand, you might want a slightly more interesting, ‘fun’ set of your keys for every day – those metallic blue keys will certainly catch the eye! But spare keys also allow other family members and visitors to come and go with more freedom. Beyond that, perhaps you have a rental property and need a set of keys to the property for both you and your tenants. Whatever the reason, the locksmith will have the expertise to select and cut the perfect copy for you. Have you locked yourself out of the car? Are Car keys broken in the door? Then auto locksmiths services are for you. These situations are so frequent, yet it’s easy to overlook how frustrating they can be. Saving customers in quandaries like these is more than worth the call out charges every time, especially if time is of the essence. Similarly, all the same, security reasons apply to cars as they do for homes and premises. In instances of car crime, then repair or replacement of locks will become necessary. Car locks may be changed when the car is sold, for example, or if there is some security reason that requires resetting access to the vehicle. And, of course, it is always handy to have a set of spare or extra car keys, which your Cardiff locksmith will deal with happily. One thing is clear: there will always be a need for good, reliable locksmiths! In the home, workplace, car and beyond, their services can be life-savers when you need them most. Make sure you have their contact details handy; life can be unpredictable, and you never know when you might need one to save the day. During busy periods, we pass on our enquiries to Tony’s Locksmith, our highly recommended local Cardiff locksmith. In lame man terms, a locksmith is a person with the required training on working with locks, keys and security systems. Their responsibility is to repair broken or damaged locks, design and make keys, install alarms and security systems. · Residential or establishment services – locksmiths design the locks and keys used in any building ranging from houses to offices and even cars, to mention a few. They design locks and keys with a varying range of quality and price, depending on the material used. Some locks can be traditional or modern, depending on what it is to be used for. Most times, locks with higher quality are able to withstand damage and last longer than their lower quality counterparts. The choice of the kind of locks to be used in a home is dependent on the location of the house and the type of house. Houses located in areas with high crime rates would require locks that are designed to keep intruders out and are able to withstand physical damage received from intruders trying to break in. Houses located close to forests with wildlife would require locks that are strong enough to withstand the damage of large wild animals, and would be totally different in size, style, and material used from a lock used in a house located in an area with a high crime rate. Locksmiths also design locks used inside of a house such as locks for rooms, cupboards, safes, etc. · Automotive or vehicle services – most locksmiths have been trained and have acquired the right skills and tools to crack into a car, either modern or vintage. This skill is used to help people who have been locked out of their cars to regain access into them, without damaging or changing the lock. A car with a faulty or damaged lock, or a damaged key can’t be opened easily, unless by a specialist. So with a locksmith be rest assured that access into your locked vehicle is only a matter of minutes, if not seconds. · Key duplication and lock repair services – this is a skill that is possessed mainly by locksmiths only, that is if the skills are not also possessed by individuals of other occupations. Locksmiths have the ability to duplicate any form of key, and also have the skills and tools required to repair faulty or damaged locks. Most times keys get misplaced and locks get damaged one way or the other. Sometimes, it might just be the need to have spare keys to avoid the danger of losing the only key available for access into the house, car, or safe. Locksmiths would duplicate a key in a matter of time and in the quantity required by the user. The duplicate key would not in any way be lesser in quality, function or texture to the original key. All you just have to do is walk to the locksmith’s shop, present a sample of the key to be duplicated, and that’s it. So it is advisable to get duplicates of every key you use to avoid getting stranded by misplacing your only key. · Installation services –locksmiths have also been known to be proficient in setting up internal security systems such as high tech security systems used to intensify the level of security in a home, office, vehicle, safe, etc. These high tech security systems would include high end security gadgets (usually attached to doors), security cameras, motion detectors, high end safes (usually built into walls), etc. These gadgets and devices can be installed by locksmiths. It would even be advisable to hire a locksmith for any installation of security gadgets and devices, because of their professional knowledge of locks and security systems. Do Modern Locksmiths Make Keys? You might be in a rush and you accidentally lose your keys or worse still leave them in the house. This happens quite often to many people. However, this should not worry you because locksmiths are all over to make duplicate keys of all types. This range from house keys to car keys. The type of the lock in question will dictate the type of key to be produced, its cost, level of expertise required and also the time taken to make the key. For Cylinder Rim Locks also known as Yale Locks, a locksmith will have two options for unlocking them. First, they will have to search for the lock cylinders. If this fails to work, they drill the lock so as to open the door and afterwards change its barrel. If you happen to misplace the key to a Mortice Lock, the normal procedure is usually to drill it in order to access the premises. The lock is then replaced with a new one which is of course having a new key. A third lock type known as restricted lock requires the professional to either make a new key for you or consider replacing the suited lock. The modern locksmith is professionally qualified to make keys. Even if making of duplicate keys has been in existence since the early days, it is still not an easy task. This is mostly for car keys. A locksmith will need thousands of variable keys to try as much as possible to match the un-machined blank keys of a car manufacturer. Making a key that will be in a position to push the tumblers into the correct place hence turning the cylinders can be hectic. Modern cars have electronic transponders for security purposes. They communicate clearly with the receiver as a final verification to start the car. With that in mind, it is crystal clear that making keys is not a cut in the cake. It is indeed true that locksmiths do make keys, but the duplicate key can only allow you to gain access to your car, but cannot ignite it due to the electronic transponders. The cost of making your duplicate key will depend on some factors. First, the type of the key will be a great determinant. For car keys, the model of the car dictates the type of key in use. Older models have simple keys while modern day cars have additional features that are complex. With the current technology, car keys have really changed, making duplication of modern keys more expensive compared to the old keys. In addition, the type of machine used to make the key will also determine the cost you incur. The machine type influences the accuracy of the key, time required to complete the process and also the level of complication of duplicating the key. The more the time taken to duplicate the key, the higher the costs. Lastly, the place that the duplication process is taking place highly predicts the duplication costs. If you take your key to a local locksmith, they will of course lower the prices for you. If you take the key to a trusted locksmith, who not only has the duplication knowledge but also other skills, you will definitely have to dig deep into your pocket. The professionals not only model the keys but also offer other services like emergency vehicle opening, removal of broken ignition keys, programming of the transponder chip key and emergency trunk opening. You will however need to hire a professionally qualified locksmith for the latter services. A professional locksmith can install a deadbolt without a lot of difficulties. According to a research in the United States, a door with a deadbolt is less likely to be broken in to by burglars compared to a door without a deadbolt. For maximum security, ensure that your door has an installed deadbolt. There are many different types of deadbolts the major ones being the double or single cylinders. Single cylinders are less complicated than the double cylinders because they are operated by a twist knob on one side and the key can only be used on the other side. This is risky if you have a window near the door. In the case of a double cylinder deadbolt, it will only open if a key is inserted in any of its two sides hence they do not use or have the old fashioned twist knob. Another type is the vertical deadbolt, which was invented by Samuel Segal. This bolts have the ability to withstand jimmying, a process where an unwanted entrant inserts a bar in between the jamb and the knob in trying to pry the deadbolt out of the lock. Others that have been tried and tested include the exit only deadbolt that has no external cylinder, single cylinder deadbolt with a removable thumb turn, a classroom deadbolt that unlocks doors with a thumb turn only and push button deadbolt that can be either mechanical or electrical. It would be a risk by failing to install a deadbolt on an external door. A door without a deadbolt is similar to a car ignition system without an electronic transponder. It is more or less like a useless security system. A deadbolt boosts the security of your door to the highest levels. Without a deadbolt, the normal lock is vulnerable to compromise at any time of the day. Contrary to popular belief, the pin tumbler situated on the doorknob and the deadbolt operate separately. A deadbolt steel bolt which is either single or double, automatically locks into its correct place in a strike plate located in the door jamb. Single bolts are one sided and will therefore require a key on one side only to unlock the lock but double bolts will require a key on both sides to unlock it. With the rise of forced entry crime rates, the Federal Bureau of Investigation (FBI) recommends that you reinforce your door with a deadbolt because it make it harder for burglars to kick in your door. The metal strike plate is secured to the door frame using 3 inch screws by professional locksmiths and for maximum security, the strike plate has an extension of the deadbolt. Comparing the installation costs of a deadbolt with the value it gives, you will realize that the installation costs are way cheaper. The cost of losing your property due to a door breaking case is not even comparable with that of installing a deadbolt. The costs will depend on the type of deadbolt, the place that you purchase it and the locksmith hired. Total installation costs range from $ 100 to $ 250. However, even with the prices low, it is advisable that you hire an experienced locksmith who will perfectly install the deadbolt than just considering the prices which might cost you someday. Locksmiths have surely improved the door security systems by installation of deadbolts. However, the double deadbolts have been criticized because in an emergency, people locked inside a room cannot be able to exit the premises without the use of a key. Locksmiths have grown to occupy a special place in people’s phone books, digital or otherwise. These professionals provide some of the most needed and crucial services. If you have been through the misfortune of losing your only set of keys, locking yourself out, or breaking a key in a lock, then you understand how important it is to know a locksmith or two. From unlocking car doors to cutting keys to re-keying locks, these tradespeople provide a host of critical services. Locks may have evolved into sophisticated systems, but the profession is far from being new. Locksmithing dates back thousands of years when royalty and churches used to hire tradesmen to secure different structures. Security is not a concern that is limited to the modern age. In ancient times, traders worried about transporting their goods through dangerous roads. 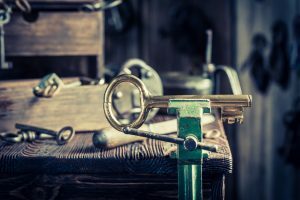 Egyptian and Roman royalty are some of the cultures that benefited from the expertise of locksmiths. The need to protect wealth and keep away intruders saw the locksmith market grow in prominence. The locks used during the ancient times were wooden and crude in design. All that the device had to accomplish was to stop a door from moving. There were pins in the lock, which pulled downwards to secure a door. The key was designed with teeth to pull the pins upwards when it was inserted into the lock. Ancient keys were just as cumbersome as the locks, but they carried out the needed functions. 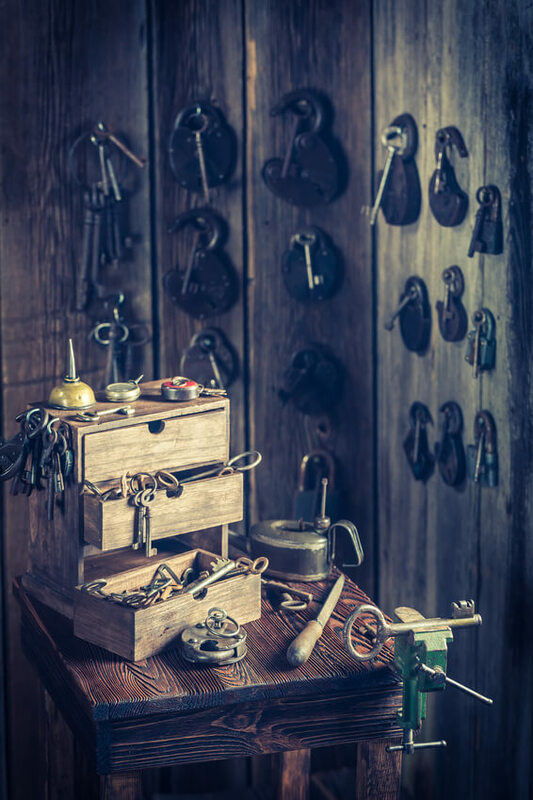 Locks then evolved into metal devices in the 18th century when metals became common commodities. As a result, locksmiths began crafting more complex locking mechanisms. At this point, lock-making was a respected skill that was associated with the best craftsmen. The English people are credited with the first metal locks. Tradespeople were able to make improvements to previous designs and develop devices that are more durable. Metal provided more flexibility than wood when it came to style, so the aesthetics of locks improved significantly during this period. From metal locks, the locksmith market moved onto grooved locks. The mechanism included grooves in the opening, which made it impossible to turn a key that was not made for that specific lock. 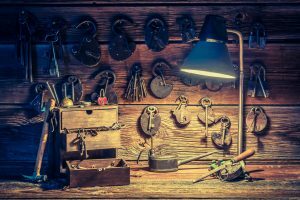 Locksmiths evolved from being artisans to all round tradespeople. 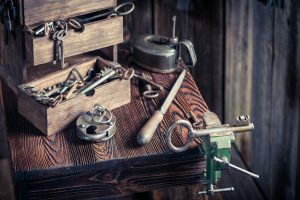 After the advent of the industrial lock that was mass-produced, locksmithing was more than just designing the mechanism. Locksmiths had to learn how to repair these industrial locks, cut keys for them, or replace them entirely when they broke. The industrial revolution also saw the lock grow into a more complicated mechanism that offers better protection. An updated version of the tumbler lock entered the market, courtesy of Robert Barron. The lock used a lever that had to be lifted to a certain degree to open. Next was the Chubb detector lock in 1817, which was inspired after a burglary in the Portsmouth Dockyard. The evolution continued to concepts like the six levers in locks, double-acting pin tumbler and most recently, electronic chips. Keys changed as well to keep up with the new locking mechanisms. They became smaller and more intricate. The lock types that people use today are a combination of some of the old designs, although some individuals still prefer antique locks. A locksmith has to be well-versed in different types of locks to provide customers with satisfactory services. Besides residential services, these professionals deal with problems involving auto and commercial locking systems. Modern day locks are integrated with different technologies to improve security. For instance, car locks are connected to computer systems, which send codes to the respective keys when users press particular buttons. 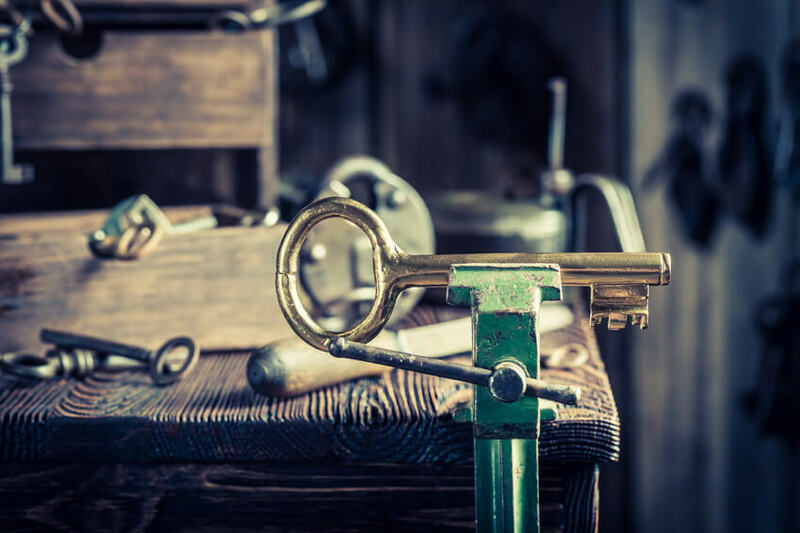 Whatever the type of lock it is, a locksmithing service is a valuable investment. With the emergency and mobile services that some locksmiths offer, customers can rely on expert assistance when they need it. This video by the police offers a number of top tips about home security. Some of these tips are very easy to implement. Top Tips for securing your Cardiff home. The front door is still the most common entry point for thieves and seasoned burglars know where to lock for spare keys you may have hidden. We also make it easy for burglars with over 30% gaining entry through unlocked doors. So simply locking your doors and not keeping a spare key in easy reach of the door will significantly reduce your chances of break-in. Securing your front and back door with good quality locks and ensuring you have window locks and they are locked will help you defeat the casual burglar. Around 40% of break-ins do involve forced entry so having good locks. There are also simple other things you can do such as not leaving notes for delivery drivers saying you are out. Having lights and radio on timers can also make it more unlikely they will target you. Burglars will always go for the easy target. If you are away for an extended period of time ask neighbours or friends to perform daily checks and collect any mail or newspapers, so your property does not look vacant. A home security system can also provide further protection and a monitored system will provide additional protection, however this will be accompanied by a monthly monitoring fee. Whatever you do if a burglar is intent on getting in they will, however by following the above tips you will make it as difficult as possible for them and hopefully they will go elsewhere. Between December 2016 and November 2017 there were 2825 burglary’s in the Cardiff area which accounts for 5.69% of all crime in the area. With around 142,600 households in Cardiff this may seam a relatively small number, however if you are one of the 2825 burgled properties this will be of little consolation to you. If you need a reliable locksmith in Cardiff then call us today on 029 2190 0230 and see how we can help you.